Don’t blame Hillary Clinton for for emails crimes, instead blame FBI director James Comey. That is what Democrats are doing. Outgoing Senate Democratic Leader Harry Reid said on Sunday hat FBI Director James Comey may have violated the Hatch Act, barring political activity by federal employees from influencing elections. This claims comes from the Friday letter to Congress with regards to emails found during the Anthony Weiner investigation that implicate Hillary Clinton and her private email/server scandal. Really? An FBI director informs Congress and amends his previous under oath report to them when he finds out that there is more information and a reported 650, 000 emails and he is said to have committed a crime? SICK!!! Dingy Harry is nothing more than a partisan hack. As also stated at CNN, Don’t blame Comey for this mess. This was of Hillary Clinton’s doing and now her undoing. Make no mistake about this America, this was obstruction of justice and lying to the FBI. Senate Democratic Leader Harry Reid said on Sunday that FBI Director James Comey may have violated the Hatch Act, barring political activity by federal employees, through a late election season letter to Congress about the scope of the bureau’s probe of Hillary Clinton’s private email service as secretary of state. Comey’s letter on Friday to congressional committee chairs said the FBI is reviewing newly discovered emails that might be linked to Clinton’s private server. The new emails were found several weeks ago, law enforcement officials told CNN Sunday, but the FBI did not disclose them until Friday. The timing raises questions about why the information was released just days before the election. There has been no immediate response from the FBI. The Hatch Act prohibits FBI officials from using their official authority to influence an election. Reid said that by releasing this information, which he says is not conclusive or pertinent, Comey may have broken the law. Reid referenced a memo from Deputy Attorney General Sally Yates from March of this year that establishes all Justice Department employees, including Comey, are subject to the Hatch Act. Reid accused Comey of having intent to aid one political party over the other in the election and called his behavior a “double standard” due to the fact that, as Reid claimed in the letter, Comey has information related to Donald Trump’s dealings with Russia. Makes you really wonder, doesn’t it? Senate Minority Leader Harry Reid (D-Nev.) backpedaled Wednesday after joking that, among the current Republican presidential field, he’s considering backing Donald Trump for the nomination. Donald Trump in an MSNBC interview that he gets along with three of the most vile Democrats out there, Nancy Pelosi, Harry Reid and Chucky Schumer. Trump then went on to say that he would work with Democrats. WHAT!!! Dude, if elected you are about to be handed the presidency with a GOP controlled House and Senate, and you are going to be working with Democrats? Sorry, but the only way we are ever going to be able to fix this country is do nothing what Pelosi, Reid and Schumer want. It is their polices and Obama’s that have been driven down our throats without our buy in that have caused the damage. People better take a good listen to what this man is saying before the vote. He has only praise for these three shrill Democrats but can say nothing good about his Republican presidential contenders? “I think I’m going to be able to get along with Pelosi — I’ve always had a good relationship with Nancy Pelosi,” Trump said Tuesday on MSNBC’s “Morning Joe,” referring to the House minority leader. The real estate mogul is targeting GOP rival Ted Cruz, against whom Trump is running neck and neck in Iowa a week out from the state’s caucuses. Trump argues that the Texas senator won’t work with others in Congress and that while both candidates have positioned themselves as political outsiders, Trump argues even Republicans don’t want Cruz. The Republican field for president in 2016 is full of “losers,” Harry Reid said in an interview that aired Wednesday. The Senate minority leader, a boxer in his youth, delivered some spirited blows while talking with CNBC’s John Harwood, calling his Republican counterpart Mitch McConnell “a lump of coal” and slamming alternative theories about how he sustained his eye injury. 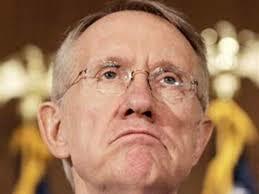 Reid also said he doesn’t really care who wins the Republican nomination for president. “I think they’re all losers,” he said.